I was saddened today to learn of the death of Councillor John Byrne who I understand died yesterday from a suspected heart attack. John was presently serving as Deputy Mayor of Bury and last year when he served as Mayor of the Bury our paths very frequently crossed as the Member of Parliament and the Borough’s Mayor are frequently together at various civic engagements. I always found John very easy to chat to and we shared a common interest in cricket and football and whilst we may have disagreed about the political means of improving the lot of people there is no doubt he was committed to doing all he could to try and help the residents he served with such distinction. My thoughts and prayers are with his widow Brenda and his family. A very happy, peaceful and blessed Christmas to all visitors to my humble blog. I am spending Christmas at home with family and, in addition to attending to my duties as one of the churchwardens at St. Anne’s on Christmas Eve and Christmas Day, I am planning to go down to Crompton Meadows to watch the traditional Boxing Day cricket match between Tottington St. John’s and Brooksbottom. It does not look as though the fixture will be played in snow as it was the last time Tottington hosted the game but I am sure there will be great entertainment as ever. The House of Commons may have risen for th Christmas recess but work in the Constituency continues. Today I have had a meeting with the Principal of Holy Cross College in Bury to discuss the progress the College is making. Then a meeting with Greater Manchester Fire and Rescue Service was followed by a surgery. This evening Susan and I attended the annual carol concert organised by the police at Bury Parish Church. Last Christmas the driving test centre in Bury suffered damage from flooding as a result of which it had to be closed. Not surprisingly driving instructors and their pupils were very greatly inconvenienced by this and in the summer I enquired when the Centre was to re-open and I was told it was to be late 2011. With only days left to the end of 2011 I enquired again at the last business questions before the Christmas recess to be told by the Leader of the House of Commons that the re-opening is now anticipated to take place in February. I hope it does now re-open as it will be a great relief to instructors and all those learning to drive as they have had to travel further afield to gain experience of the sort of roads they are likely to face on their driving test. I do not share the view that the overnight news that the Prime Minister’s refusal to join in a new European Union treaty will somehow leave us isolated and sidelined in Europe. The fact is that next week Germany will still want to sell us their cars and France sell us their wine. More importantly our European neighbours will still want to buy British goods and services. I think the Prime Minister was absolutely right to defend British interests and I think the majority of British people will support his view. The claim that there this has suddenly created a two tier Europe ignores that fact that ever since the single European currency came into being there has been two groups of countries in the European union those inside the Eurozone and those outside the Eurozone. All that has happened is that this division has been highlighted and reinforced. I have long believed that the single currency as it is presently constituted is doomed. This country greatly benefits from being outside the Eurozone. Nothing I have seen about what was agreed at this summit has led me to change my view about this. After my week in Westminster and Scotland Friday was as ever full of constituency visits and meetings. The day began with a visit to Kays Soaps in Ramsbottom. 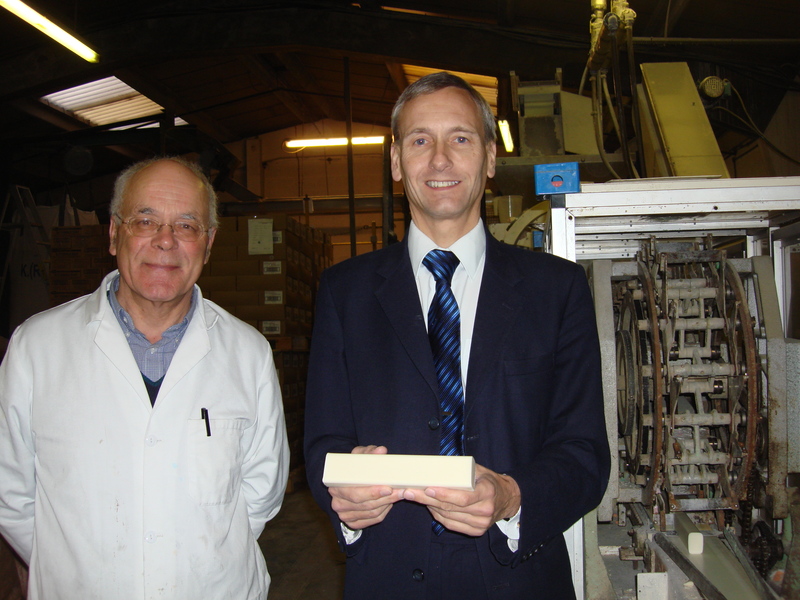 The Company is believed to be the oldest soap making company in the Country and one of only a handful of such companies still left in the United Kingdom. The process has changed little over the years and it was fascinating to see the soap bubbling in the tanks. After a meeting with the Six Town Housing to discuss a range of social housing issues it was back to the office to deal with constituents casework. In the evening I opened the Christmas Fair at Holcombe Emmanuel CE Primary School and then after a quick change went down to the Longfield Suite at Prestwich to attend the Mayors Annual Civic Dinner to raise funds for local charities. Last week I took part in my first official Parliamentary visit. Parliamentarians have frequent opportunities to travel to all corners of the globe and I guess there are few weeks when there is not a delegation out visiting some distant land. As a new member of Parliament I have always declined such opportunities preferring to spend as much time as possible in Parliament and in my constituency but this week along with other members of the House of Commons Procedure Committee i travelled up to Edinburgh to visit the Scottish Parliament. We met with members of the Petitions Committee and members of their Procedure Committee. Our findings will inform our enquiry into the operation of the e-petitions system.